Adults with crooked or gapped teeth tend to find themselves stuck between a rock and a hard place. They would love to straighten their teeth, but they just can’t make themselves get uncomfortable and noticeable metal braces. So, many just avoid treatment for years. Now, dentistry has an option that is perfect for people in this exact situation: ClearCorrect. ClearCorrect completely does away with the traditional wire and bracket system, and with it, Dr. Pate can give you a perfectly straight smile without you having to worry about your daily appearance. If you’re ready to see what ClearCorrect can do for you, contact us today for an appointment. 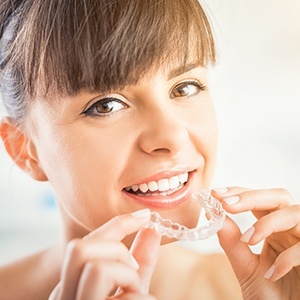 ClearCorrect uses a series of custom-made clear plastic aligner trays to gently and discreetly straighten the teeth. A patient changes the aligners every three weeks to move the teeth into a straighter position step by step. Dr. Pate checks your progress regularly and delivers the next set(s) of trays. The patient should wear the trays at least 22 of every 24 hours. Treatment duration varies for each patient. It’s just that easy, and millions of people around the country are already smiling more often because of it. Subtle Appearance: ClearCorrect’s trays are practically invisible when worn on the teeth, so you won’t have to worry about anyone noticing your appliance when you’re at work or out with friends. With it, you can smile with confidence all throughout your treatment. Comfort: Your trays will be custom-designed to fit your individual smile using sleek and smooth plastic, so you won’t have to deal with irritation on your gums, lips, or cheeks. Convenience: The trays are actually removable, meaning you can take them out whenever you need to eat or brush your teeth. This, unlike braces, will allow you to maintain your normal diet and oral hygiene routine while straightening your teeth. Speed: In some cases, ClearCorrect actually works faster than traditional orthodontics. On average, treatment times tend to range from about 12-18 months as opposed to 2-4 years with braces. Also, because it doesn’t have to be regularly adjusted like braces, you won’t have to make as many progress checks with your dentist as well. If you are a working adult who feels like your crooked teeth are holding you back, then ClearCorrect can help you. If your misaligned teeth make you feel shy and socially self-conscious, ClearCorrect can help you rediscover your confidence. If you have a teenager who needs orthodontic care but would literally die if you made them get braces, ClearCorrect can help them, too. When it comes to straightening the teeth in the most subtle, comfortable, and effective way possible, ClearCorrect is the way to go. If you have avoided fixing your teeth for years because you thought your only choice was metal braces, now you have another option. To learn how ClearCorrect can give you the beautiful straight smile you’ve always wanted, contact us today.